Atlanta Mission transforms, through Christ, the lives of those facing homelessness. We are a community united to end homelessness…one person at a time. Atlanta Mission has been called by God to serve the city of Atlanta. 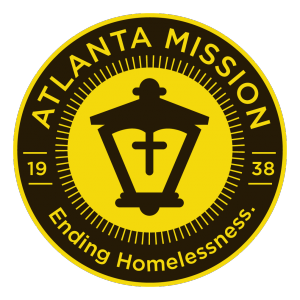 Atlanta Mission is the city’s largest and longest-running provider of services to homeless men, women and children. Since its 1938 beginnings, this Christian nonprofit ministry has grown from a small soup kitchen to a multi-facility organization serving Metro Atlanta’s large homeless population. Today, Atlanta Mission provides emergency shelter, rehab and recovery services, vocational training, services, and transitional housing. We serve more than 1,000 homeless men, women, and children every day. We believe that a relationship with Christ is the key to restoration, redemption, and sustainable change for everyone. We invest in the spiritual, personal, and professional development of people, restoring and equipping them to intentional living. We believe that in empowering and coaching people toward excellence, we impact the quality of all we do. Various factors lead to homelessness — job loss, eviction, family tragedy, addiction, domestic violence, a major health condition, and more. The common denominator is a major crack in their life foundation. Our services are multi-pronged and multi-layered, designed to meet people where life has led them. Capacity: 264 women and children in overnight shelter, childcare, recovery services, counseling, and vocational training. Capacity: 140 women and children receiving critical care assistance, childcare, and life skills classes. Capacity: 450 men in overnight shelter, recovery services, counseling, and vocational training. Capacity: 180 men in recovery services, counseling, vocational training, and transitional housing.